Later topic: Sans serif lead type specimen sheet? Earlier topic: Does anyone recognize these ornaments? Could someone help ID this face? I’ve looked backwards and forwards through McGrew but cannot find that “H”! Cheltenham Bold Outline. The “H” pictured is an alternate character. This is Baltimore Type & Composition Corp’s casting of Cheltenham Bold Open, No. 12. 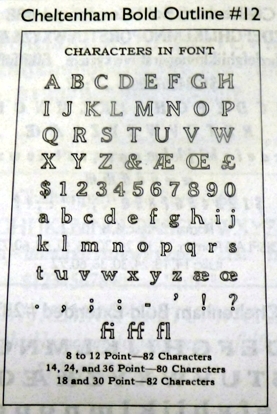 Any foundry castings of Cheltenham Bold Outline never had an alternate H. It is possible that the slanted H was the only one in Baltimore’s fonts. Thanks for the correction regarding the “alternate” H.
Monotype #12 Cheltenham Bold Outline has the slant H, and there are a few other differences from the foundry version. Baltimore Type & Composition #12 does not include lower case and it is called “Open”. And now I see that the Monotype alternates actually are shown in McGrew—I just didn’t look carefully enough!